When you trust a hospital or nursing home, you also trust that they will take care of you in your time of need. Unfortunately, every year more and more people become injured as a result of negligence by hospitals and nursing homes. In fact, in the past studies were done by the Care Quality Commission that found that at least 20 hospitals had care so poor that patients were actually denied the basics of life. This included things that we take for granted everyday, like eating, drinking, and going to the bathroom. But what happens when a hospital or nursing home has acted negligently? Can they be held responsible for their actions? Bed Sores are one of the most common types of abuse that you may find in a hospital or nursing home. These are lesions on the skin that are a result of pressure on bony parts of the body. The pressure decreases the blood flow in these areas and causes tissue to die, leading to the sores. Often times, when an elderly person is in a hospital or nursing home setting, they may be left forgotten or neglected by staff and sit on unchanged sheets for too long. They may also not be moved often enough to avoid bedsores. This would be seen as negligence and could be cause for a lawsuit. If you or a loved one has sustained an injury in a hospital setting, you may wonder how you would be able to receive pain and suffering. Your injuries sustained in the hospital may have caused you physical or mental pain and suffering on a level that nobody else can understand. So how do you put a number on this pain? Juries must use their good sense, background, and general experience when determining a fair amount of compensation for the plaintiff. If a loved one has become too injured or has even died due to negligence, talking to a good attorney is in your best interest. When making a medical malpractice claim after you or a loved one has become injured, there are many things that must be kept in mind. For instance, you must be aware of the statute of limitations, which requires you to file your claim within a certain time period after the injury has occurred. You should also have a medical assessment to confirm that your case has merit (FindLaw). Contact an attorney you can trust today for more information on a medical malpractice case. If you have suffered an injury at the hands of a medical professional, you may hold the negligent party liable for your injuries. 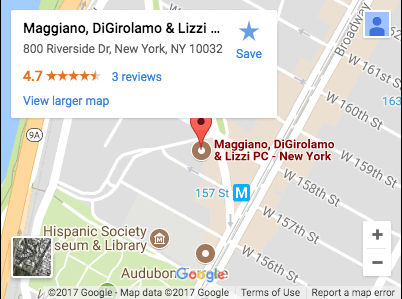 Call Maggiano, DiGirolamo & Lizzi today for more information.